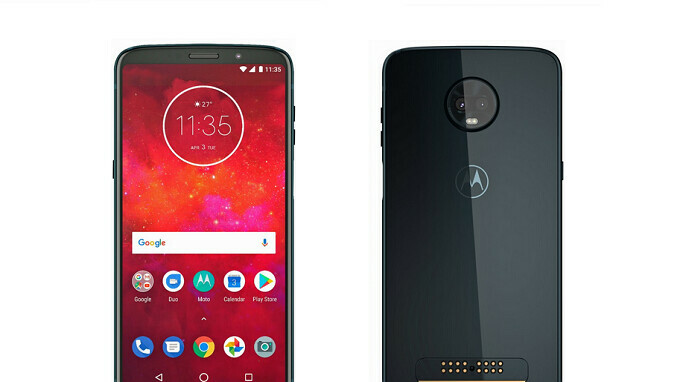 Last month, renders of the Moto Z3 Play revealed a side mounted fingerprint scanner, and a dual camera setup on back. The other day, we showed you a live picture of a Moto Z3 Play prototype. The image showed off the 18:9 aspect ratio and trim bezels that are now found with the third-generation of Moto's Z series phones.Today, thanks to reliable leaker Evan Blass, we have a new render of the Z3 Play in Deep Indigo. The image shows off the side mounted fingerprint scanner and once again the dual camera setup appears. Underneath the camera, where many phones have a fingerprint scanner, is a static image of the Motorola Batwings logo. 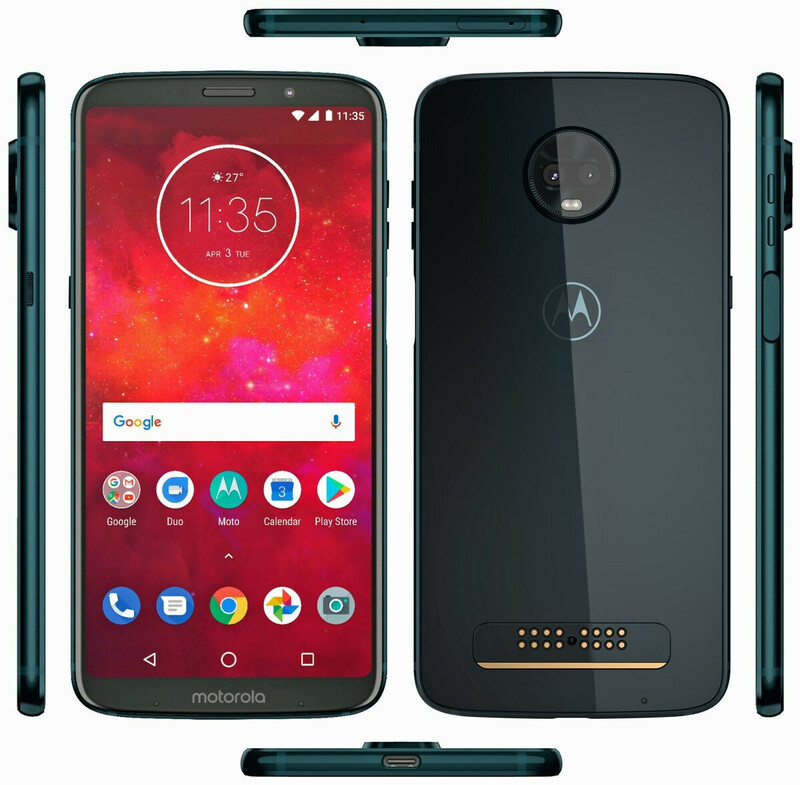 The Moto Z3 Play is expected to be equipped with a 6.1-inch display carrying a 1080 x 2160 resolution. The dual cameras on back are believed to weigh in at 12MP and 8MP, and we could see the Snapdragon 636 mobile platform under the hood. 4GB of RAM and 64GB of native storage are reportedly onboard, and a 3000mAh battery is said to be powering the device. The 3.5mm earphone jack is MIA, and Android Oreo will be pre-installed. Yeah. Mostly because it so thin with slim bezel(no notch needed). It’s a nice looking phone compared to the previous gen but will it still feel too big in the hand? I think they should also scrap the whole modular design to. It just doesn’t seem worth it anymore. That phone looks pretty good!! So, the smallest battery ever on a Motorola Z Play device and no 3.5mm jack. Otherwise looks the same as the previous version. No thanks! Just why there are keeping 3000Mah battery only like Z2 play and X4?Moto Z1 play had 3510Mah battery,i don't understand why they are playing cheap with it and on top of that they are removing headphone jack for no good reason.I hope battery don't turn out to be this lvl. That's a bigger MOTO Z! what about mods?! Does the mods work in this new generation?! No headphone jack?? Moto why do that?? What a bizzare decision!!! Yes, no notch!! I can't wait for my Z3 force. So on the right side is a fingerprint sensor? And the power button is integrated into it? Then what is the button on the left side? Programmable function button? Or is the fingerprint sensor by itself and the button on the left is a dedicated power button? I would like to see the first option. But really I am not interested in the Z3 Play, where are all the leaks for the Z3 Force? That's the one I want to see! !